GrandChase released its global version only a couple of hours ago: The game can be played for about 12 hours and is already quite popular. 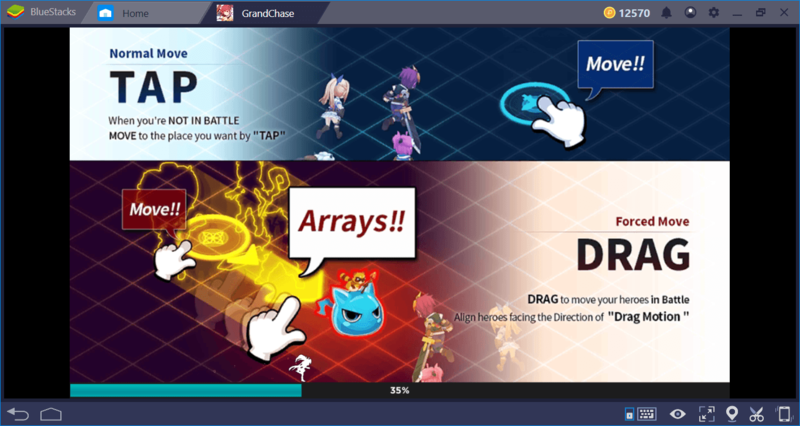 As we said in our Preview article, we prepared GrandChase’s review and beginner guide right after the release. Below, you can see what our first impressions about the game are, and if you’re new to the world of Aernas, you can learn what to do. Let’s start without further due – a huge world is waiting for us to discover and fight! 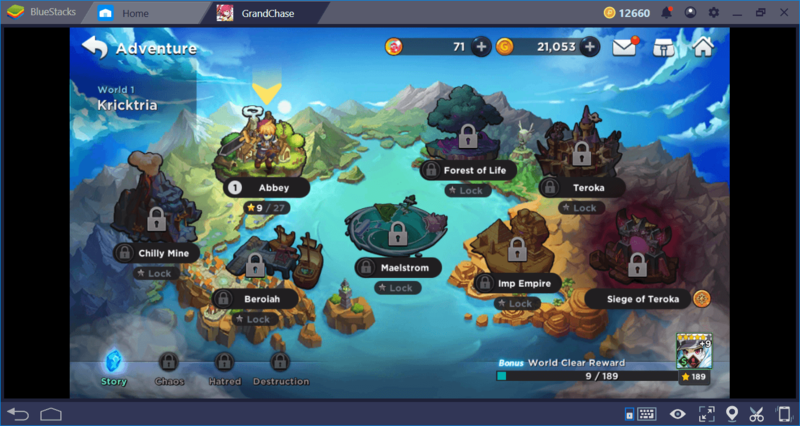 We’ve prepared an article about GrandChase’s story so far: if you’d like to know more about the history of the game, we encourage you to read it. We’re not going to repeat the story here, but let’s say that you will meet with members of the original GrandChase team sooner than you think! 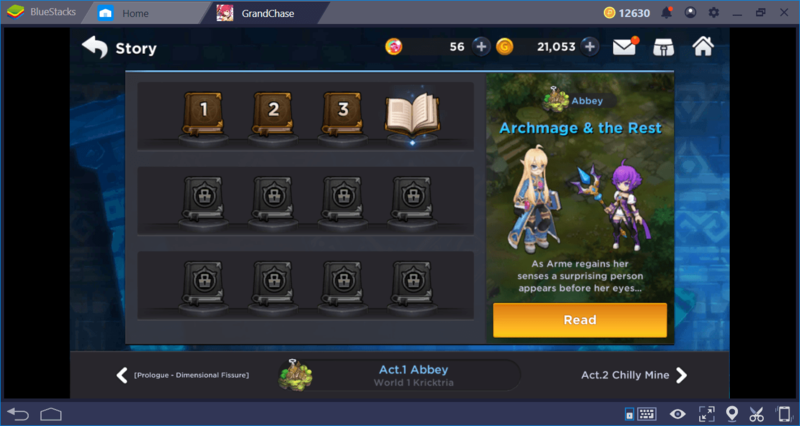 At any time, you can see what has happened in the GrandChase universe so far through the “Story” menu. 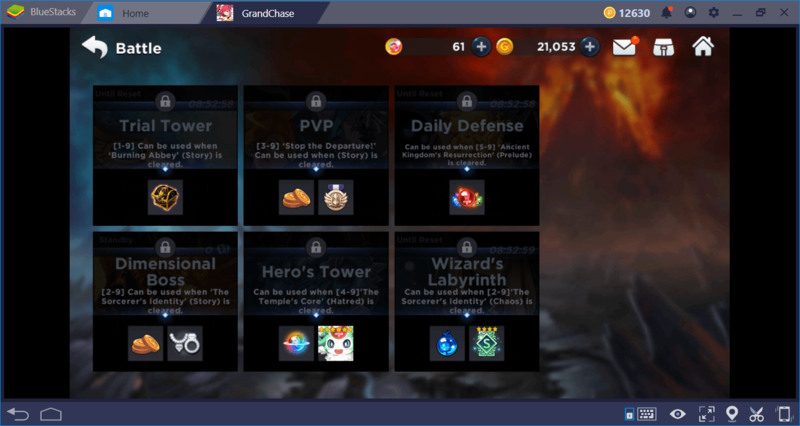 If you’re new to the game, you should definitely do this: GrandChase has a very impressive and engaging story, and knowing what’s going on gives you a more immersive experience. Let’s start with the monetization system. 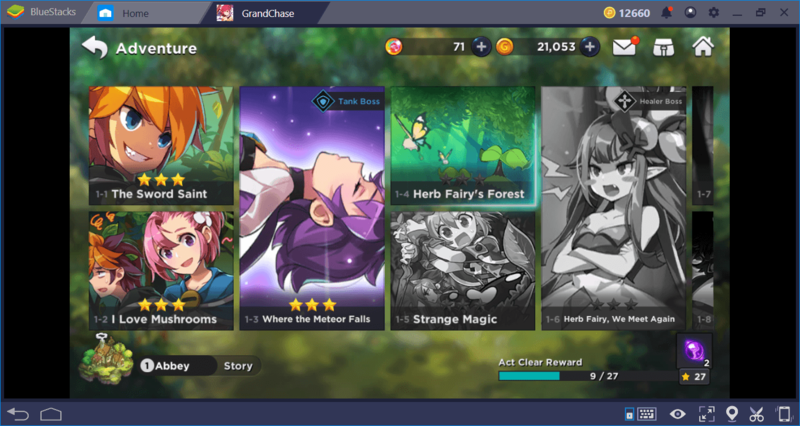 There are three currency types in Grand Chase: Gem, gold, and prana. Gold and prana can be won for free with in-game activities. Gems are sold for real money. When you start the game for the first time, you’ll get some free gems, but if you want to get enough to purchase something, you have no choice but to buy them. The good news is that no part of the game needs any currency at the moment. You do not have to make a payment or use an item to complete the missions and events. 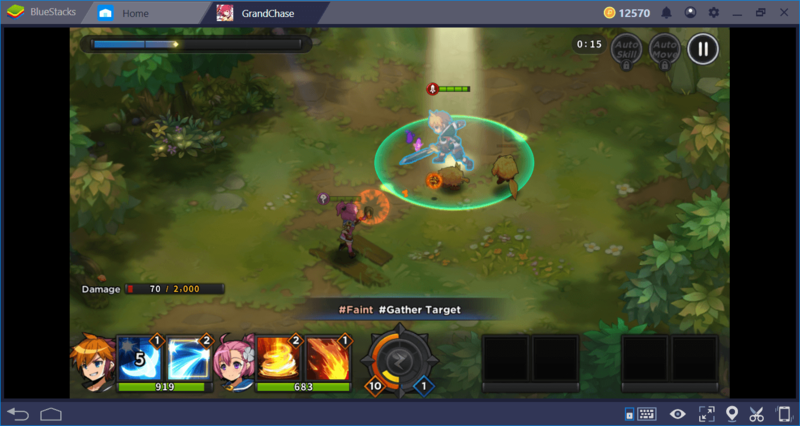 As we guessed in our Preview article, GrandChase does not impose any restrictions on its mechanics: You can play as much as you like. 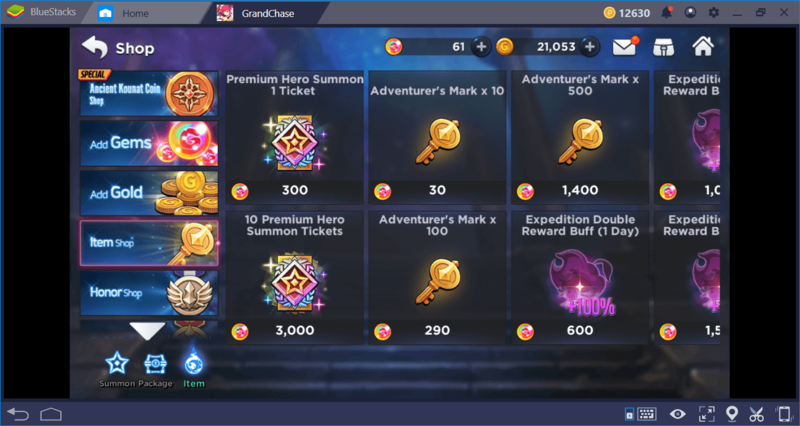 The gems are used only to make a Premium summon and buy “Adventurer Marks” – both of which are not very important. So if you’re playing for free, you don’t have a crippling disadvantage. We congratulate KOG Studios for this choice. GrandChase missions can be divided into two basic categories: PvE and PvP. PvP options are currently very limited and there is no option other than an arena. 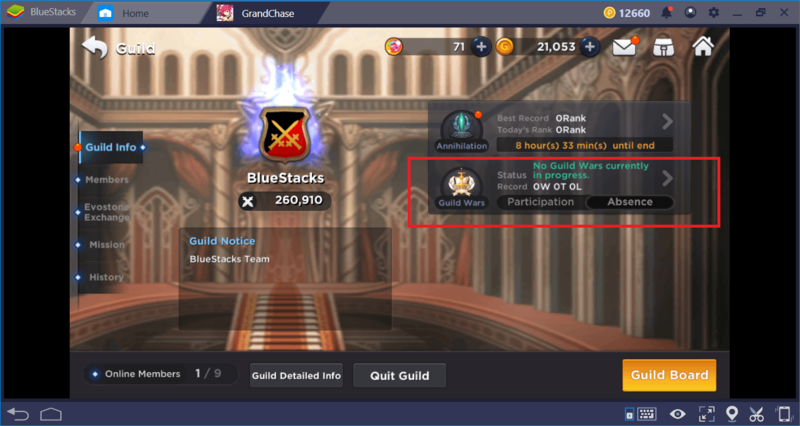 But when the “Guild Wars” begin, this will change: It seems that wide battles between guilds are important for GrandChase and in the near future, we will see improvements on this feature. To access the PvE options, just click the “Adventure” button. When you do this, the world map opens and you see a list of the regions you can visit. You can complete a mission multiple times and try different difficulty levels. All missions require you to travel over a small map and kill all enemies on it. In the final mission of a region, you will fight against a “boss”. Completing missions allows you to earn items and XP points. Using them, you can increase the level of heroes in your party and let them use higher-level abilities. We will give more detailed information about this topic in our “Battle System” and “Heroes” guides. Clicking on the “Battle” button in the main menu opens a screen showing activities you can do outside of story missions. In other words, you are asked to complete all of the story missions in order to participate in all the activities in the game. Therefore, we recommend that you focus on this first. 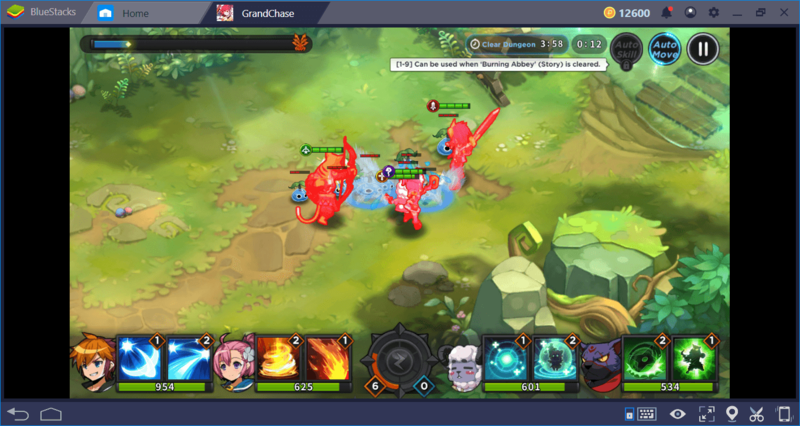 GrandChase is an action RPG game and almost 90% of the game takes place on the battle screen. Therefore, it is important that you have information about how the battle system works. We will prepare a comprehensive guide on this topic, but we can mention a couple of things that will help you here. For each mission, you have to create a party of four and give the heroes of the party different roles. Your first party at the start of the game consists of a tank, a healer, a ranged dps and a melee dps. This setup is more than enough to complete all story missions. The battle system is dynamic and real-time. However, when using a skill, the game slows down for a few seconds. This is normal because you need to decide where to use the skills. For example, you can decide where an AOE (area-of-effect) attack will take place. This means that you should always keep track of what is happening on the screen. 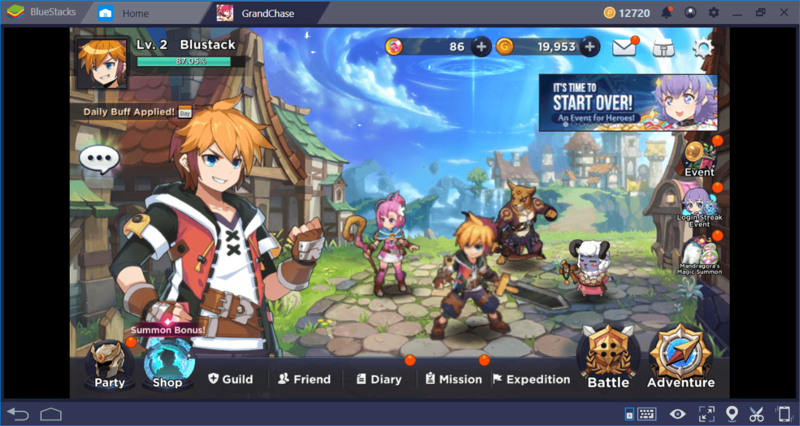 In addition, this mechanic provides an excellent opportunity to use the BlueStacks Combo Key feature: We will discuss this in more detail in another guide. Each party member has two skills available. But you decide which of these will be used. A hero can learn a lot of skills, but he can bring only two of them to the battlefield. Every skill has a CD (cooldown) period, so you need to pay attention to the order in which they are used. In addition, always pay attention to playing ground: If you see a red circle, you need to get away! It’s easy to control your heroes. Just click where you want them to go. When a battle begins, you will switch to a more dynamic control system by making a scrolling motion with your mouse. Let’s say that the battles are quite challenging: If you are not paying enough attention, even the mobs (*) in the first Act can kill you. (*) A term used for the standard enemy type. GrandChase also uses gacha mechanics. You can add new heroes to your party through summoning. 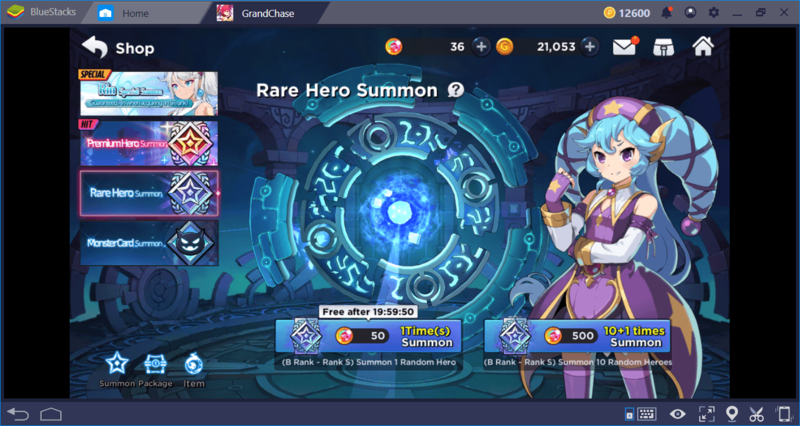 There are two summon methods: premium and normal. There are over 100 heroes in the game and each one has different abilities. Also, the levels of their rarity are quite different. We will give you more detailed information about the summon system in another guide. 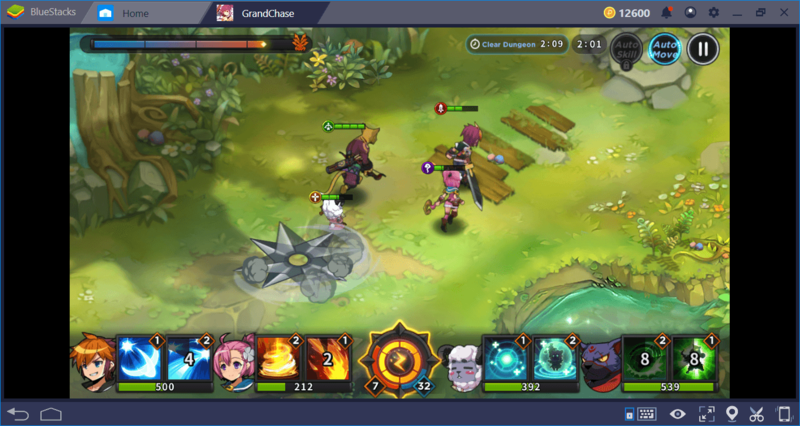 We liked what we’ve seen so far: GrandChase doesn’t use a greedy monetization system and offers refined action RPG/gacha mechanics perfectly. 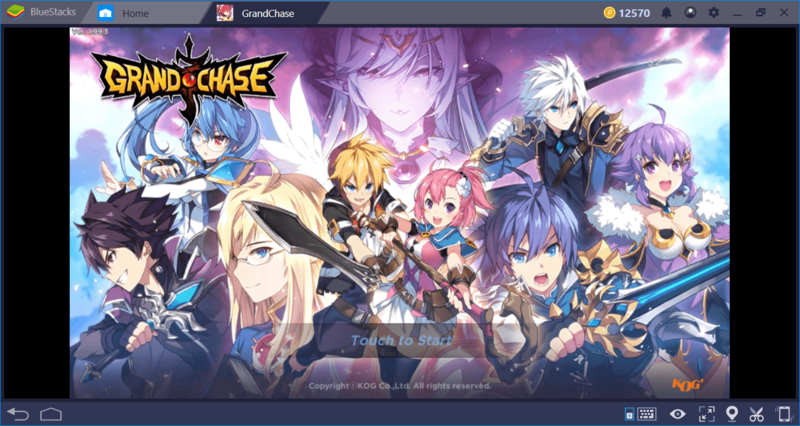 Truth be told, all the features it has are available in other games, but GrandChase incorporates them into a legendary story. 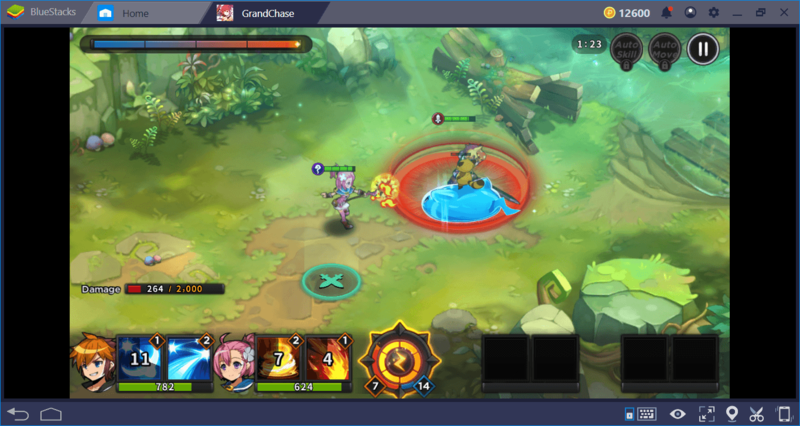 If you like ARPG games, we can say that GrandChase will be one of your favorite games in 2019. 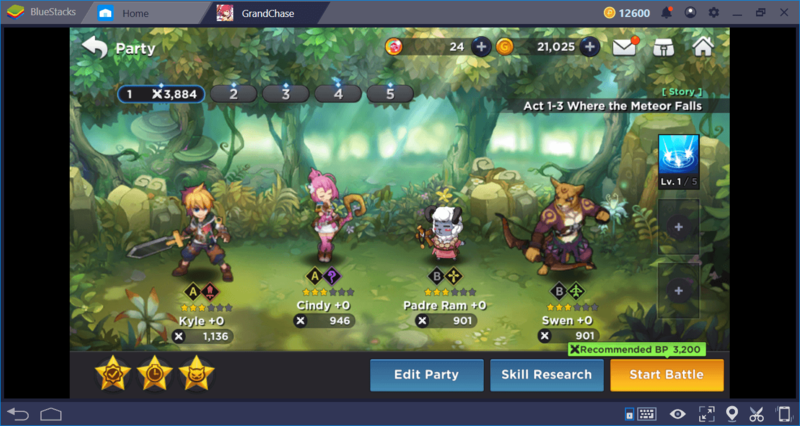 We are preparing a lot of guides about the game and they will be available to BlueStacks users pretty soon. Don’t forget to read them to make your adventure in the world of Aernas easier!